SageGlass®, pioneer of the world’s smartest electrochromic glass, announces that its dynamic glass is now able to be integrated with voice controlled speaker systems. Building occupants can now control the dynamic glass tint via simple voice commands to optimise daylight and outdoor views while preventing heat gain and glare. This offering is expected to be integrated into larger building management systems so building owners and facilities managers can manage SageGlass along with other voice-enabled smart devices in the building. SageGlass’ integration with voice-controlled systems provides occupants with additional flexibility so they can control the dynamic tinting of the glass without the need for facilities management intervention, a wall switch or mobile app. Occupants can ask SageGlass to reduce glare, and watch the glass tint in accordance with the command. SageGlass provides smart building installation documentation and sample codes, detailing how it can also be integrated with other building management components. SageGlass completed its first Amazon Echo integration at the Saint-Gobain North American Headquarters in Malvern, Pa, USA. SageGlass is the pioneer of the world’s smartest electrochromic glass and is transforming the indoor experience for people by connecting the built and natural environments. Electronically tintable SageGlass, a product of Saint-Gobain, dynamically optimizes daylight and manages temperature – all while maintaining unobstructed views of the outdoors. 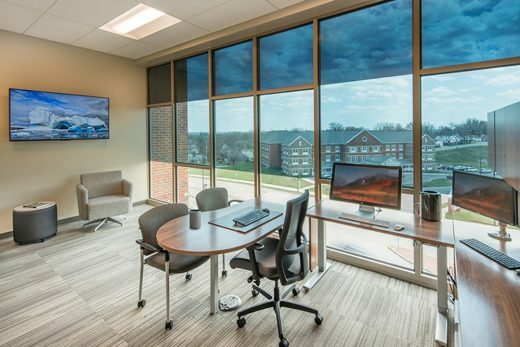 With SageGlass, building occupants can comfortably experience the biophilic benefits of the outdoors, including stress reduction, enhanced creativity and an improved sense of well-being. Unlike conventional sun controls, such as mechanical window shades or blinds, SageGlass allows architects to elegantly solve solar control challenges without sacrificing aesthetics and design. As a wholly owned subsidiary of Saint-Gobain, SageGlass is backed by 350 years of building science expertise that only the world leader in sustainable environments can provide. Ready to look again? Visit www.SageGlass.com, @Sage_Glass and Facebook.com/SageGlass. Saint-Gobain designs, manufactures and distributes materials and solutions which are key ingredients in the wellbeing of each of us and the future of all. They can be found everywhere in our living places and our daily life: in buildings, transportation, infrastructure and in many industrial applications. They provide comfort, performance and safety while addressing the challenges of sustainable construction, resource efficiency and climate change. With 2015 sales of 39.6 billion euros, Saint-Gobain operates in 67 countries and has more than 170,000 employees. For more information about Saint-Gobain visit www.saint-gobain.com and @saintgobain.